Recently, one of our clients completed something that they probably didn’t think was possible only a few years ago. Nicola had undergone a bilateral knee replacement and as it is with anyone who undergoes such a surgery it had a significant impact on her life. The team at Longevity have worked very hard to help Nicola regain strength in both legs, but more importantly regain flexion in her knees which is considered the most critical factor post-knee replacement in terms of return to function. Since then, Nicola has returned to skiing, bike riding and loves her long walks, particularly on the weekends with friends and family. As you can imagine, our whole team is very proud that Nicola was recently able to achieve a milestone of walking 30km uninterrupted as part of the Sydney Coastrek 2017 and on top of this raised a huge amount of money for the Fred Hollows Foundation. We were also very pleased to contribute to the fundraising in a small way. “Our team “Bionic Knees Rock” completed the 30km Sydney Coastrek 2017 walk from Kirribilli to Bondi Beach on 17 March 2017. I walked with my sister Romilly Madew, my husband Kym Evans (also a client of Longevity Personal Training) and my cousin Helen Stacey (who flew up from Adelaide). We started the walk at 7am in fairly atrocious conditions (torrential rain and gale force winds). However, the weather cleared and luckily stayed fairly rain free for most of the walk. As most of you know, I had a double knee replacement 3 years ago so to walk 30kms for me is a huge achievement. Walking became my therapy after the operation and I have been walking for 3 years with my husband Kym, sister Romilly, cousin Helen, fellow double knee replacement buddy Cecelia (who named the team) and all my Camino friends including Linda Fox and Jennifer Blunden. Our team raised $4,600 towards the Fred Hollows Foundation. 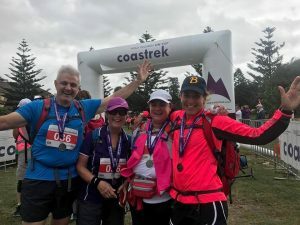 A stunning $2,546,387 was raised in the Sydney Coastrek last Friday. The funds will be used to restore sight to many disadvantaged people in Australia and overseas. If you are looking to start personal training and exercise physiology in Sydney, we are more than eager here at Longevity Personal Training to get you started! Our team of personal trainers and exercise physiologists is ready to give you the best tailored exercise program to achieve your very personal goals. Partnered with other quality health professionals in Sydney suburbs such as Edgecliff, Double Bay, Woollahra, Killara, Roseville and Lindfield we are looking forward to giving you the best shot at achieving your health goals, whether it’s weight loss, energy or muscle strength training. Don’t hesitate, book in today! Jarrat is the Founder of Longevity Personal Training and has been working in the fitness industry for over 10 years with more than 20 years elite sport experience. He has a B Sc (Health and Sport Science) from UNSW and is a Cert IV Personal Trainer.